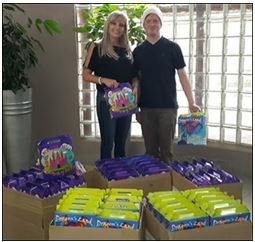 (PRLEAP.COM) February 15, 2014 - Johannesburg, South Africa – Last year December, Konica Minolta South Africa donated over 160 Christmas party packs to the young children of the Leeukop Prison Pre-school and the Reamogetswe Resource Centre in Muldersdrift. These gift packs contained sweets, treats, chips, a cool drink and an age-appropriate toy for each child. The 65 packs for the Leeukop Prison Pre-school were handed over by Konica Minolta South Africa's public relations officer, Janine Ferreira, to Patti Hanley - the architect of the Diepsloot Pre-schools Project, which Konica Minolta South Africa supports. "The children of the prison warders are isolated within the prison compound, so to have a treat like this is absolutely wonderful for them. The children had a great party, and we would like to thank Konica Minolta South Africa for the kind donation of these Christmas party packs," says Hanley. Ferreira handed over the 103 Christmas party packs for the Reamogetswe Resource Centre to Michael Anthony of AAAKEE (Abused and Abandoned Kids Educational Excursions), a South African Public Benefit Organisation (PBO) that provides educational excursions around South Africa for various foundations involved with children who are disadvantaged, having been abused and abandoned. These excursions, as much as they may be educational, are also intended to enrich these children's lives with fun, entertainment, and excitement - a core value in the life of any child. Anthony, in turn, handed out the party packs to the children of the Reamogetswe Resource Centre, which looks after neglected children from around the area, during their Christmas party. "Christmas is a wonderful time of year for most children, but it is important to remember those who are less fortunate, for whom Christmas is not a magical time. At Konica Minolta South Africa we are dedicated to making a difference in the lives of the communities in which we operate, and we were delighted to be able to bring joy to these children at this special time of year," says Ferreira. Konica Minolta South Africa (KMSA) provides a comprehensive range of business solutions to businesses of all sizes, countrywide. The organisation is wholly owned by the Bidvest Group and believes in product excellence and exceptional service. KMSA is also the principal importer and distributor of the award winning bizhub collection of multifunctional printers, copiers, fax machines and other digital devices. Headquartered in Johannesburg, KMSA has an impressive distribution network that includes 17 branches and 49 dealerships in Southern Africa.